Groff Campus - System Technologies Inc. 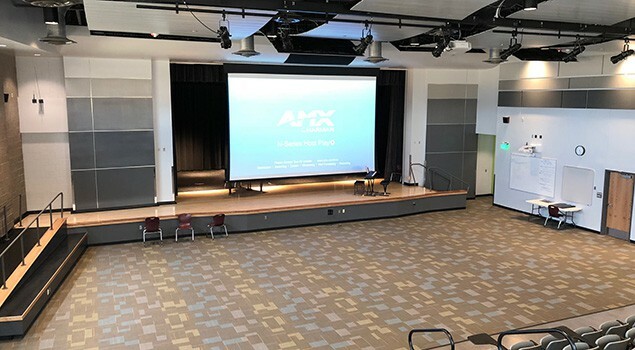 This large-scale auditorium features AMX control, AMX IP video switching, Biamp digital audio signal processing and an iPad driven digital mixer for front or back of house mixing. These components drive the tuned JBL speakers that can be partitioned into separate areas, and a 10,000 lumen Epson laser projector for a 267-inch motorized screen for presentations. As well as the auditorium, STi installed 25- 70-inch interactive TVs in classrooms and an audio system in the gymnasium. This system utilized 16 JBL pendant speakers, 4 JBL subwoofers, a JBL mixer, 2 Shure wireless mics with Shure antenna distribution and Crown amplifiers with on board DSP.